Thomson Reuters Corporation (NYSE:TRI) investors should be aware of a decrease in support from the world’s most elite money managers lately. TRI was in 19 hedge funds’ portfolios at the end of December. 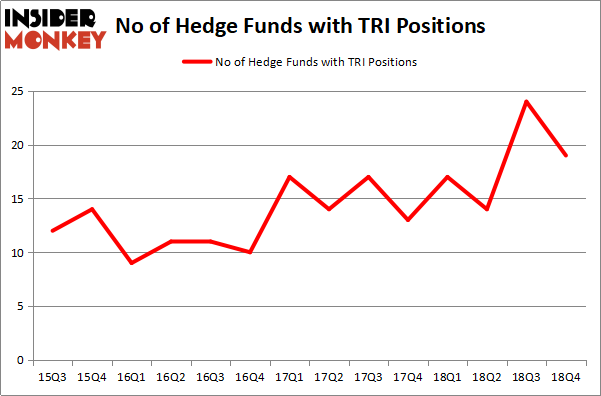 There were 24 hedge funds in our database with TRI holdings at the end of the previous quarter. Our calculations also showed that TRI isn’t among the 30 most popular stocks among hedge funds. Let’s check out the new hedge fund action encompassing Thomson Reuters Corporation (NYSE:TRI). At the end of the fourth quarter, a total of 19 of the hedge funds tracked by Insider Monkey were long this stock, a change of -21% from the previous quarter. On the other hand, there were a total of 17 hedge funds with a bullish position in TRI a year ago. With the smart money’s capital changing hands, there exists a select group of noteworthy hedge fund managers who were adding to their holdings considerably (or already accumulated large positions). The largest stake in Thomson Reuters Corporation (NYSE:TRI) was held by Citadel Investment Group, which reported holding $63.3 million worth of stock at the end of September. It was followed by Clearfield Capital with a $23.8 million position. Other investors bullish on the company included AQR Capital Management, Two Sigma Advisors, and Lunia Capital. Since Thomson Reuters Corporation (NYSE:TRI) has experienced declining sentiment from hedge fund managers, it’s easy to see that there lies a certain “tier” of hedge funds who were dropping their positions entirely heading into Q3. It’s worth mentioning that James Parsons’s Junto Capital Management sold off the largest position of the 700 funds tracked by Insider Monkey, totaling about $27.9 million in stock, and Benjamin A. Smith’s Laurion Capital Management was right behind this move, as the fund said goodbye to about $24.9 million worth. These transactions are important to note, as aggregate hedge fund interest fell by 5 funds heading into Q3. Let’s now take a look at hedge fund activity in other stocks similar to Thomson Reuters Corporation (NYSE:TRI). These stocks are PPG Industries, Inc. (NYSE:PPG), Amphenol Corporation (NYSE:APH), Ferrari N.V. (NYSE:RACE), and Equity Residential (NYSE:EQR). This group of stocks’ market values resemble TRI’s market value. As you can see these stocks had an average of 22.75 hedge funds with bullish positions and the average amount invested in these stocks was $611 million. That figure was $192 million in TRI’s case. Ferrari N.V. (NYSE:RACE) is the most popular stock in this table. On the other hand PPG Industries, Inc. (NYSE:PPG) is the least popular one with only 19 bullish hedge fund positions. Compared to these stocks Thomson Reuters Corporation (NYSE:TRI) is even less popular than PPG. 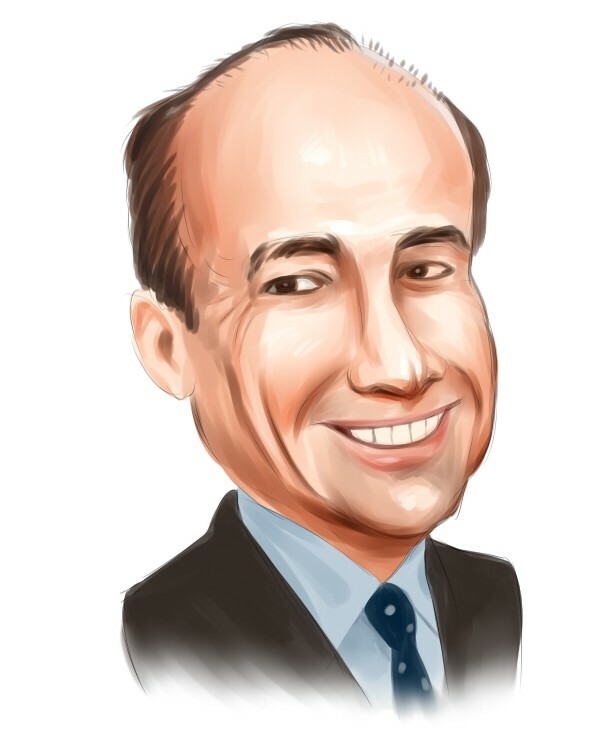 Considering that hedge funds aren’t fond of this stock in relation to other companies analyzed in this article and the stock’s recent performance, we can say that hedge funds dropped the ball on TRI. Luckily they did better with other stocks. Our calculations showed that top 15 most popular stocks among hedge funds returned 19.7% through March 15th and outperformed the S&P 500 ETF (SPY) by 6.6 percentage points. A few hedge funds were also right about betting on TRI, though not to the same extent, as the stock returned 17.4% and outperformed the market as well.